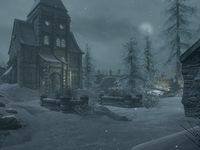 Thalmor Embassy is the Aldmeri Dominion's diplomatic mission to Skyrim, located north of Solitude, which serves as the center of Thalmor activity in Skyrim. The embassy is a gated complex. Elenwen is the resident ambassador, known for hosting the province's most powerful men and mer at lavish ambassadorial parties. It is via an ill-gotten invitation that the player infiltrates the building as part of the main quest line. You will arrive inside the courtyard after speaking with Delphine during Diplomatic Immunity. There are two sets of double metal gates leading into the courtyard from the outside and a separate building containing the barracks, the door to this is locked and requires a key to enter. In the courtyard is the carriage you arrived on and Razelan a fellow guest at the party. There are also two Thalmor guards and a Thalmor wizard standing in the courtyard; one of the guards patrolling the courtyard, one at the bottom of the stairs who will check your invite and the wizard standing near the entrance to the interior. As soon as you enter you'll be in the reception room where the party is already in full swing. Elenwen will immediately approach, however Malborn will interrupt her enabling you to avoid a lengthy conversation. There is a small wardrobe containing fine clothes and with a copy of Uncommon Taste on top to your left. To your right is a small cupboard containing clutter. The guests present vary depending on several factors, see the related quest for details. In addition to Elenwen there are two guards, Illdi the bard, Brelas a serving girl and Malborn within the room. Everything in the embassy can be freely taken, except where specifically stated. The room is fairly square with heavily vaulted sections around the east, south and west sides and a fireplace in the middle of the north wall. There is a snowberry bush in a vase to the right with wooden benches on either side. Speaking to Brelas will grant you a bottle of Colovian Brandy, but you are limited to a single bottle in your possession. It is marked as a quest item and can not be dropped. Behind Brelas is a small set of shelves holding some goblets and a red mountain flower. In the southeastern corner is a table laid with two platters holding seven seared slaughterfish steaks, two baked potatoes, three tomatoes, and two portions of grilled leeks. Between two of the arches is another narrow table with a stack of plates and a platter holding two sweet rolls and two honey nut treats. Against the south wall is a narrow table with a bowl of bread and plate of a sliced eidar cheese with an iron dagger on top, to the right of this is another table laid with two platters holding a leg of goat roast, two pheasant roasts, a horse haunch, three sweet rolls and an apple pie. In the southwest corner is yet another table laid with a platter of bread and cheese, a bowl of three red apples, a bunch of tundra cotton, two bottles of alto wine and a potion of regeneration. Against the west wall is a small round table with three common books on top and one of several wooden benches against the walls of the room. There are two internal doors in this room, one to the south with a guard beside it and one to the west, behind Malborn, who is behind a counter serving drinks. On the counter is a bottle of alto wine and one of wine, several goblets and a small mead barrel. He will instruct you to arrange a diversion so that he can slip you out of the room. Through the door is a narrow storage area with three sets of shelves holding seven bottles of alto wine, four bottles of wine and two bottles of Nord mead, with two stacks of food barrels opposite. Malborn will lead you through the kitchen where Tsavani the cook will ignore you after Malborn threatens her. In the kitchen are three sets of shelves, two sets of wall shelves, two tables for preparing food, several open crates, many loaves of bread and pieces of cheese, four food sack and barrel. In the middle of the west wall is an oven shelves, with a woodcutter's axe on an unusable block to the right. Malborn leads you through a door in the east wall into another storage room where you find an unlocked chest containing any gear he smuggled in for you, seven food sacks, a small cupboard with an open crate on top containing two leeks and five tomatoes. Hanging from the ceiling are two pheasants, a bunch of dried elves ear, a bunch of dried frost mirriam and three garlic braids, three wall shelves holding a bottle of alto wine, a bottle of wine, several cheese wheels. There is a second door in the southeastern corner that leads to a corridor. Malborn will be in a hurry for you to pass through this door so that he can lock it behind you, before he is missed at the party. You will need to move a few paces along the corridor in order for him to lock the door. Once in the corridor he will advise you are on your own before locking the door behind you. You can hear two guards talking in a room through an open door on the left about a group of mages sent to help with the dragon problem. There is a cupboard on your immediate left with a bottle of alto wine and a thistle branch on top. There is a second cupboard on the far side of the door and a narrow table with a bottle of alto wine and a potion of light feet on top at the end of the corridor. 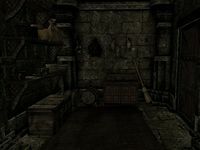 There is also an open door on the right, the room contains a low table with a set of Thalmor robes, and gloves on top and a pair of boots on the floor beside it. The room is used as a storage room containing unused furniture and other items, with cobwebs and dust all around. There is a mead barrel containing bottles of Nord mead and a food barrel with a basket containing potatoes on top, several rolled up rugs, and various items of fine crockery and candlesticks, a couple of tables and sets of shelves, but nothing else of interest. After a few moments the two guards will get back to their patrols, allowing you to either sneak through or deal with them individually. 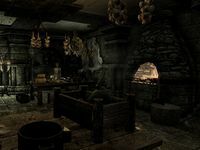 The room they are in has a small counter on the immediate right with some bread and cheese on top and a narrow table behind it with an iron dagger atop, a food sack below and a wall shelves above holding two bottles of Nord mead and a bottle of alto wine. On the left is the second door seen in the reception room where the party is ongoing on the left and a partition beyond that. In the southeast corner is a low table and bench with a plate of bread and cheese and a bottle of alto wine on top. Beside this is a set of shelves holding a bunch of tundra cotton, a bunch of lavender, a draught of strength, a potion of health, a potion of regeneration and a common book. In the south wall is a doorway into another store room containing two cupboards holding a set of fine clothes, a pair of boots, a gourd, three garlic bulbs, a bunch of tundra cotton, a single loose septim and two food sacks. In the southwestern corner is a flight of stairs leading up with a small wardrobe to the left and a basket beside it hiding a small coin purse. 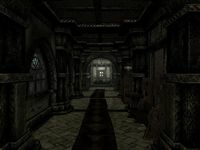 At the east end of the room is a corridor heading south with a small cupboard and table with a candlestick on top to the side a vase containing a snowberry bush at the end and around the corner a door to outside either side of which are another small cupboard with a thistle branch on top and a set of shelves holding two pairs of Thalmor boots, two bottles of wine and a basket containing two bunches of lavender. The stairs lead up to another corridor running east to west. 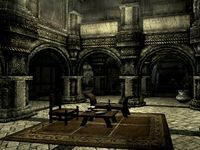 To the east is a table with a copy of Dwemer History and Culture on top, a set of shelves holding seven common books, and past a doorway into another room is a small wardrobe with another copy of Uncommon Taste on top. The room contains a long dining table in the middle with two bottles of alto wine, a potion of regeneration, two seared slaughterfish steaks, two baked potatoes, a portion of grilled leeks and a bunch of tundra cotton on top, a small table at one end has a bottle of wine in top and a small unit at the other holds another bottle of alto wine and has a small mead barrel on top. On the east wall are two sets of shelves holding two random poisons, a random potion of magicka and one of stamina, a random empty soul gem and a common book. In front of this is a low table and chair with a bottle of wine and another book on top. Against the south wall is a small cupboard with an owned bunch of juniper berries on top and to the right is an open crate containing two more empty random soul gems, a random potion of healing and one of magicka and an owned bunch of lavender. Finally against the west wall is another set of shelves holding a draught of strength, a potion of health, a potion of regeneration a bunch of tundra cotton, a common book and two bunches of lavender in a basket. To the west, at the end there is a room on the right and an open area in front of a door leading outside opposite. The room is a bedroom containing a large owned double bed coming out from the north wall with end tables on either side having candlesticks on them and a long unlocked chest at the foot of the bed. To the right is a narrow table with a bottle of frostbite venom on top. In the northeast corner is a small wardrobe and against the south wall is a tall wardrobe, both containing fine clothes and boots. There is also a low table with a bottle of alto wine, a plate of bread and cheese and a potion of regeneration on top. By the door is an open crate containing a bunch of tundra cotton and a red mountain flower and next to this a wash basin. To the left in the open area are two small cupboard with a drum and potion of health on top one of them and three wall shelves holding a bottle of alto wine, two bottles of Nord mead, a potion of plentiful healing and a bunch of lavender. There is also a low table and chair with a common book a bottle of wine, and a plate of bread and cheese on top. Through the door to the outside is the end of a path around the outside wall of the courtyard. There is one guard standing against a wall to your left by a gap in the wall, another patrolling the courtyard, a Thalmor wizard also wandering the courtyard, and a second standing in front of the entrance to Thalmor Embassy, Elenwen's Solar There are two planters in the middle of the courtyard containing three lavender plants, a thistle and blue mountain flower. If you are sneaking when you first enter you are able to sneak past a Thalmor guard standing in front of you, facing away. To the right and at the rear of the room is a small storeroom. From there you are able to overhear a conversation between a Thalmor agent and an informant named Gissur. They are discussing an old man and trying to locate him. In the store room is a small cupboard with a drum, flute, deathbell flower and potion of health on top, with a wall shelf with three common books on above it and two sets of shelves holding two bottles of frostbite venom, two deathbell flowers, a bowl of void salts, a bowl of glow dust, two samples of slaughterfish scales, a potion of haggling, five common books, a basket containing two bunches of lavender and another containing a bunch of tundra cotton. The main part of the room has a small counter with a platter holding two sweet rolls, three red apples and two boiled creme treats, and six bottles of wine on top. along the north wall is a table with a bowl containing a bunch of tundra cotton and an iron dagger on top. Against the east wall is a small unit holding a bottle of alto wine. There is a small table with a bottle of wine on top and a low table in the middle of the room with a common books, a bottle of wine and a plate of bread and cheese on top. There are stairs opposite the entrance leading up with vases of snowberry bushes on either side. To the west and in the northwestern corners are two rooms, the first to the west is an office and contains a desk with two rolls of paper on top and a basket containing more rolls beside it. Behind the desk are bookcases holding a total of twenty common books, a flute, a drum, a potion of health, a basket containing two bunches of lavender and a lockpick, a random potion of stamina, and a solution of strength. Against the west wall is a set of shelves holding two bottles of frostbite venom, , a deathbell flower, a bowl of void salts, a bowl of glow dust, two samples of slaughterfish scales and a potion of haggling and an expert-locked display case containing two crossed elven daggers, a gold and ruby circlet and a gold and emerald circlet. Against the north wall is a tall wardrobe containing fine clothes and boots. There is also a doorway on the north wall to a flight of stairs leading down. The other room on this floor is also an office containing a desk with a bottle of alto wine, a potion of health, a potion of regeneration and two rolls of paper on top and another basket containing more rolls beside it. Behind the desk is a small set of shelves holding two more rolls of paper and an iron dagger, a wall shelf holding three bottles of alto wine and a bottle of Nord mead above an unlocked chest containing the information you need for the quest and a copy of the interrogation chamber key. There is a small table to the right with a bunch of tundra cotton on top and further to the right another table with bread and cheese on top. To the right of the door are two bookcases holding nineteen common books and copies of Lost Legends, Argonian Account, book 2 and Book 4, Short History of Morrowind, and The Adabal-a. There is also a large vase in the northeastern corner to the right of another doorway to another flight of stairs leading down containing a sprig snowberries. Climbing the stairs in the main room leads to a landing over looking the downstairs with rooms at either end. There is a small wardrobe on the landing to the east. 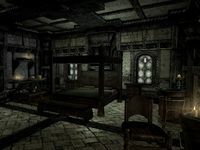 The room at this end is Elenwen's bedroom and contains a large, owned four-posted bed coming out from the south wall, with end tables on either side and a long unlocked chest at the foot of the bed. To the right is a small wardrobe, a wash basin and a narrow table with a bottle of frostbite venom on top. Beside the door is a set of shelves holding four common books, a solution of strength and a random potion of stamina. To the left of the bed is a low table with a bottle of alto wine, a potion of regeneration and a plate of bread and cheese on top and another table beside it with a platter holding a sweet roll, two baked potatoes and a cheese wheel on top and above this is a wall shelf with two common books and a deathbell flower on it. To the left is a large vase containing a snowberry bush. There is another small wardrobe in the northeast corner and to the left a doorway into a storage area containing a tall wardrobe containing fine clothes and boots, an open crate containing two bunches of tundra cotton, an unlocked safe containing a range of loot and a set of shelves holding a draught of strength, a potion of health, a potion of regeneration, a bunch of tundra cotton and a basket containing two bunches of lavender. To the west are actually two room a small store room containing a small cupboard with three common books and a deathbell flower on top and a small unit holding a bottle of alto wine and another bedroom containing a single bed coming out from the southwestern corner, with an end table to the left and a small table with a red and a green apple on top to the right and an unlocked wooden chest at the foot of the bed. There is a purple mountain flower in a large vase against the west wall, a small desk with a common book and rolls of paper on and in a basket beside it, a tall wardrobe by the door and in the southeast corner is a low table and chair with a potion of regeneration and a plate of bread and cheese on top. Descending the stairs off of the office with the chest containing the relevant info leads to an area with a small wardrobe and under the stairs a cupboard holding two goat cheese wheels, two loaves of bread and a sheaf of wheat. 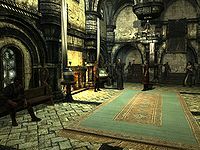 The door at the bottom of the stairs leads into Thalmor Embassy, Dungeon and is master-locked, but opened by the key found in the chest upstairs. Descending the stairs off of the office in the room to the west leads to a similar area with a cupboard holding a set of fine clothes, a pair of boots, a gourd, three garlic bulbs, a single loose septim and a bunch of tundra cotton. Under the stairs are several food barrels and an unlocked chest containing minor loot. Through the latter door is a balcony overlooking the dungeon proper, with several food barrels and a small table with a random shield and a random potion of healing on top. At the far end there are stairs that lead down to the main area where you can here them torturing someone for info, but the person keeps claiming to have told everything. There are two people at the bottom a guard doing the torturing and a wizard name Rulindil asking the questions, while seated at a table with more rolls of paper in front of him and an unlocked chest beside him containing a Thalmor Dossier: Esbern. Descending these stairs to the main area where the cells are located, under the stair are more food barrels with an unlocked chest on top containing minor loot and beside them a pile of straw with more barrels, a set of iron armor and some human bones in among it. If you enter the dungeon from the stairs off of the office with the chest you come out on a small balcony behind Rulindil with a short passage containing several dusty crates to the stars that lead down. There are many more food barrels under these stairs and through a doorway into the main area there is a set of shelves on the left holding an iron mace. In the center of this area is a torture rack, with a table beside it and a garlic bulb on top, a small unit again the east wall with a common book on the shelf and along the north wall three cells, the first contains Etienne Rarnis, who was the one being tortured, the next cell is empty and the third cell is only occupied if you used Erikur and Brelas for your distraction, in which case Brelas will be shackled to the wall. Opposite this cell is a trap door leading to Reeking Cave and escape, it is locked and requires a key and there are human bones all around the trap door. To the right is an unlocked chest and more food barrels with stairs leading up beside this leading up to another balcony with several crates, a dresser with a set of banded iron armor on top and a table at the end with two bottles of Nord mead on top. Speak to Etienne Rarnis or read the dossier on Esbern to progress the quest. As soon as the quest updates Malborn will appear on the balcony up the eastern stairs under guard of two Thalmor guards, arrested for his treachery in helping you. Both the guards are carrying a copy of the trap door key. You can free Brelas in addition to Etienne and Malborn if you wish. Use the key to escape the Embassy and enter Reeking Cave. As soon as you enter through the trap door in the embassy you are on a ledge with hanging moss growing in front of you. The ledge overlooks the main part of the cave containing a frost troll. Everyone you've freed will immediately attack, so if you want them to live you will have to move fast. Once it is dealt with in the southwest corner you will find the body of a novice conjurer, a medium coin purse, a satchel, a copy of the Illusion skill book Before the Ages of Man and an unusual gem—(see notes). 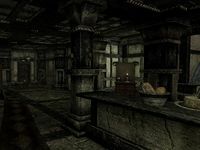 Patch 1.4 moves Unusual Gem in the Thalmor Embassy to Reeking Cave next to a dead conjurer near the trap door used to escape the dungeon. If you return to the Embassy compound after completing Diplomatic Immunity, you can enter the grounds and the barracks, but not the Embassy building. If you return with a horse, you can use it to gain access to a tree to the left of the Embassy inside the first section of the compound. Hit the jump button repeatedly and you will climb up the tree and eventually clear the fence. The whole Embassy is then accessible, except for the reception room and the kitchen. It is also possible to reenter the Embassy through Reeking Cave using platforming and the dragon shout Whirlwind Sprint. Reeking Cave is west-northwest of the Embassy. There is no icon on the map for the cave entrance, but it is near the northwest corner of the embassy and near the end of the road as shown on the map. Once in the cave, in order to get up the ledge you must walk to the top of the log, aim the crosshair slightly above the right side of the ledge you are trying to get on, and use Whirlwind Sprint. You can also noclip to the trapdoor by turning collision off by typing "tcl" in the console(To turn off, type in "tcl" again). It is possible to reenter the Embassy via the outer wall, using a kettle and Whirlwind Sprint. From standing outside the main gate, looking in, go to the left and around the corner. Where the wall again turns left, drop the kettle and then pick it up to eye level. Slowly walk to the wall. When the kettle appears to have a hole in the bottom, whirlwind sprint in. It does not appear to respawn, so those killed during Diplomatic Immunity remain dead, but prepare to deal with the remainder. It is possible to reenter using the wooden plate trick and walking through the front door. The exterior does respawn guards but not the interior. Repeat the wooden plate trick inside to access locked rooms. It is possible to summon ArvakDG on the other side of the stone fence by jumping from the snow pile onto the corner of the fence, then ride Arvak. You will then be on the blocked side of the fence. 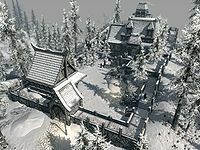 After completing Diplomatic Immunity, if you sprint and bump into a Thalmor Wizard or Soldier, all the Thalmor on the grounds of the Embassy become hostile. Do not attempt to enter the Thalmor Embassy to acquire the Stone of Barenziah within for the quest No Stone Unturned until you have received the quest Diplomatic Immunity. Doing so will trigger an event that changes the dialog options for any NPCs that are also visiting the Embassy for the party. This can and likely will be detrimental to any quests related to those NPCs (such as Jarls or Maven Black-Briar), causing you to be unable to start or complete quests requiring those NPCs until you have finished the quest Diplomatic Immunity. ? It is unconfirmed whether or not completing the quest Diplomatic Immunity using console commands would fix this error. However, it has been found that entering the Embassy before starting the quest Diplomatic Immunity may cause Delphine to no longer give the quest-related dialog that begins the quest in the first place. If you are running Patch 1.4 or later, there is no problem with entering the Reeking Cave for the Stone, so long as you keep well away from anyone in the Embassy itself until the Diplomatic Immunity quest. 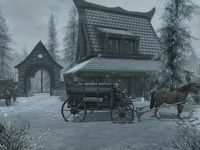 While the quest Diplomatic Immunity has not yet been started, entering the Thalmor Embassy causes stage 180 of that quest to be set to "done." Stage 180 is thought to be an invalid stage, but may in fact be the stage that changes the chat dialogs for the NPCs visiting the party. ? Attacking anyone in the Thalmor Embassy before starting Diplomatic Immunity will result in the quest being uncompletable. ? This page was last modified on 11 March 2018, at 10:29.